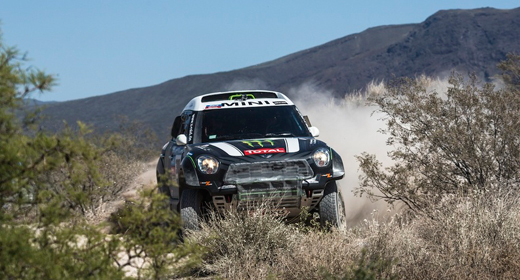 The two Frenchmen Stéphane Peterhansel and Jean-Paul Cottret in their black MINI ALL4 Racing gave the Monster Energy X-raid Team its first stage win in the 2014 Dakar Rally. They won stage two, from San Luis to San Rafael, followed by buggy driver Carlos Sainz in second position. Their team mates, Nani Roma (ESP) and Michel Périn (FRA), took their yellow MINI ALL4 Racing two fourth position, with the pairings Nasser Al-Attiyah (QAT) / Lucas Cruz (ESP) and Orlando Terranova (ARG) / Paulo Fiúza (POR) in the white and orange MINIs ALL4 Racing finishing fifth and sixth respectively. After having had to cope with ´coming fourth on day one, Peterhansel experienced a trouble-free second stage. “The first part of the special stage was extremely fast,” said the Frenchman. In the dunes the competitors had to cope with during the final 100 kilometres of the special stage, he was supported by unusual helpers. 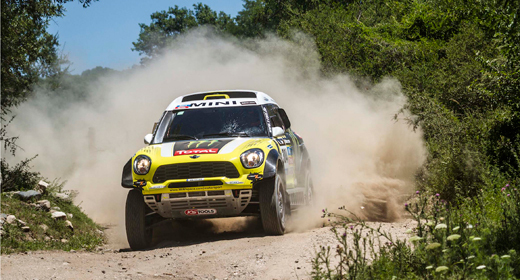 “We nearly could do without navigating as there were so many spectators on site that we could use them for our orientation.” By winning stage two, Peterhansel also took the lead in the overall standings, with his black MINI ALL4 Racing. Meanwhile, Roma in the yellow MINI ALL4 Racing was hampered by some minor problems, today. “Unfortunately, some grass had obstructed the radiator and I had to slow down again and again to let the engine cool down,” said the Catalan. In addition, he had to make a short stop due to a puncture. Nonetheless, he wasn’t too unhappy. “Its just day two and things aren’t looking too bad for us.” In the overall standings he holds fourth position, just nine seconds behind his team-mate Al-Attiyah. 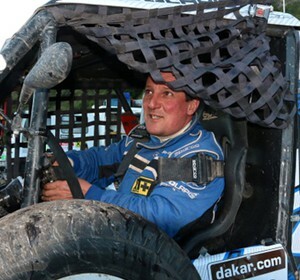 Terranova had been the second to start into stage two but soon had to adopt the pathfinder role as Carlos Sousa was stopped by a technical failure. “This alone wasn’t easy and then, something obstructed the radiator,” said the Argentinean who now holds fifth position in the overall standings. Holowczyc also had to cope with a dose of bad luck, in the second stage: the Pole also had to stop twice due to punctures. “Later we had some navigation problems,” revealed the Pole. “Unfortunately, we lost a lot of time, today.” The driver of the red MINI ALL4 Racing had to settle for finishing 13th and dropped back to ninth position in the overall standings. Tomorrow, the drivers will reach the foothills of the Andes for the first time and during the course of the stage, they will move up to more than 3000 metres over sea level. Other than in today’s dune stage, the track surface will be hard and rocky, tomorrow. Following a 202-kilometre liaison, the drivers will start into the 301-kilometre special stage that will end with just another three kilometres to go to the bivouac.